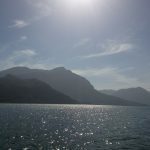 We’re off to sunny Dalyan again! We are all busy bees, dashing from A to B, sorting out kids, work deadlines whilst squeezing in time for family, friends and supermarket sweeps. But, imagine a week away from it all, immersed in peace and tranquility. Where you wake in the morning to blue skies, sunkissed mountains and wait….that’s not the sound of revving engines outside but instead the gentle twitter of birds and croaking frogs. Imagine a week all to your very self, where you get lavished with daily yoga, mindful meditations and, OMG, someone actually cooks nutritious food for you! No packed lunches and TV dinners for a whole week! 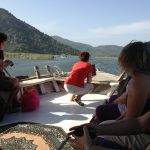 Dalyan is one of those rare places where conservation matters. Unspoilt by tourism, you’ll feel as if you’ve stepped back in time living with local people. Take a trip to the beach on a boat, marvel ancient ruins and unspoilt scenery, enjoy cleansing mud baths then take a swim in the sea with nature all around. Sigh…it’s food for the soul. We all agreed that on our return we were nicer people. Lol, it’s true! Time out from the craziness that is western living is a necessity. Nuff said! So there are your three reasons to come but if you’d like to read more then check out this piece by journalist and participant Lorenza Bacino, who’s feature appeared in Om Magazine’s 2013 Autumn issue. Go on click this link and book your place…you won’t regret it! 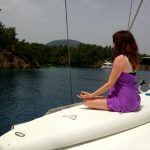 Dalyan is a magical place of ancient ruins, turtle beaches, mountains and healing mud baths. Spectrum is a purpose built yoga and activity centre nestled at the foot of the Golgeli mountains. 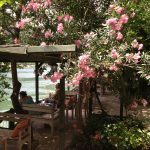 Set off the beaten track, but in easy reach of the neighbouring village and beaches, this is a private, peaceful retreat, shaded by pine trees and set next to fields of pomegranates and orange groves. Uniquely, Spectrum has been built with the single guest in mind, with ten rooms available to those not wishing to share. There is an 80 m2 swimming pool, with large terraces for sunbathing and a lovely yoga space by the pool. 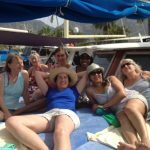 This wonderful week includes early morning and evening practice where we savour the ancient energies of this landscape as well as the options of visiting the turtle sanctuary, enjoying island cruises, and sampling exquisite local cuisine. connect and open to the energy of a peaceful loving heart! What does it cost and include? “The holiday offered me time away from the hustle and bustle of London. It allowed me time to totally relax and be at peace with myself. 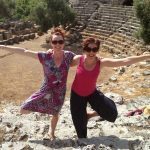 It exceeded my expectations of what I had imagined a yoga retreat to be, in that I was also able to enhance and deepen my yoga practice, have fun, explore the local surroundings and at the same time meet a great group of women who inspired me. 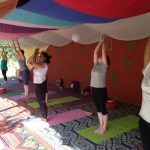 The location was heaven on earth with an outdoor yoga space that had breath-taking views of the mountains, it was a wonderful space to practice and meditate. Those of us that wanted to read were spoilt for choice and a variety of complementary therapies were available on site for total relaxation. Go on book your place here…you won’t regret it!